Here we bring you the New Adventures of Sherlock Holmes, which was was an American old-time radio show that aired from October, 1939 to July, 1947. The show first aired on the Blue Network but moved to the Mutual Broadcasting System. Sherlock Holmes was action and drama-packed, and filled with atmosphere, wonderful sound effects and great music by Lou Kosloff. 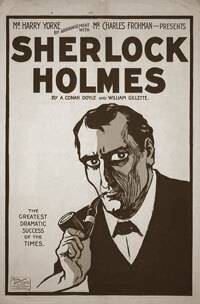 The original stars of the show were Basil Rathbone as Sherlock Holmes and Nigel Bruce as Dr. Watson. The actors took on spokesmen roles for G. Washington Tea as a visitor ready to hear a good story. Watson would reminisce about the great stories and comment on how good the tea is! The heroine of the show was Edith Meiser who loved the stories and knew they would make great listening adventures. Beginning in the 1930's she wrote the episodes of the show for over 12 years, creating stories in the spirit of the originals. If you are ready, sit back and get ready to enjoy some mystery whodunnit drama from the master of detectives -- Sherlock Holmes! 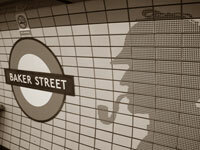 Now let's hear some Sherlock Holmes !